▶ MSBC LLC purchased 20,368 square feet of industrial/investment space at 3615 Spring Mountain Road for $2.77 million. Mike De Lew and Greg Pancirov of Colliers International represented the seller, 3615 Spring Mountain Partners Ltd.
▶ Victor Trujello dba Trujello Properties LLC purchased 2,800 square feet of industrial space in North Pecos Industrial Center at 4300 N. Pecos Road, Units 22 and 23 in North Las Vegas for $260,000. Eric Molfetta and Chris Zunis of Colliers International represented the sellers, Shawn D. &Timmi L. Dybdahl and Francisco Garcia. ▶ Benigno Zamora purchased 1,400 square feet of industrial space in North Pecos Industrial Center at 4300 N. Pecos Road, Units 30 and 65 for $130,000. Eric Molfetta and Chris Zunis of Colliers International represented the buyer and the seller, Rancho Chongo Nevada Trust and EI Terre Property Holdings LLC. ▶ Alled Lighting LLC leased 12,012 square feet of industrial space in Harsch Craig Commerce Center at 2711 E. Craig Road, Suites C and D in North Las Vegas from Harsch Investment Properties-Craig LLC. Dean Willmore of Colliers International represented the tenant. ▶ Christie Lites Las Vegas LLC leased 11,250 square feet of industrial space at 4420 Andrews St., Suite B in North Las Vegas from Choice Realty Co. Dan Doherty, Chris Lane and Jerry Doty of Colliers International represented the tenant. ▶ Integrated Biomedical Network Corp. leased 7,771 square feet of industrial space in PACE Commerce Center at 5140 S. Rogers St., Suites E and F and 4481 W. Reno Ave. Greg Pancirov, Mike DeLew and Dean Willmore of Colliers International represented the landlord, FJM Vegas Holdings LLC. ▶ Ignite Funding leased 6,577 square feet of office space in Pebble Place Business Center at 2140 Pebble Road. Suzette LaGrange and Kara Walker of Colliers International represented the landlord, CVK LLC. ▶ Ford Audio-Video Systems Inc. leased 5,408 square feet of industrial space in the Arrowhead Commerce Center (Bldg. 13) at 6255 S. Sandhill Road, Suite 100. Spencer Pinter, Dan Doherty, Chris Lane and Jerry Doty of Colliers International represented the landlord, KTR LV II LLC. ▶ Gencos USA LLC leased 5,124 square feet of industrial space in Sandhill Airport Park at 6320 S. Sandhill Road, Suite 1. Chris Clifford, Steve Neiger and Brett Rather of Colliers International represented the tenant. ▶ Fore Property Co. leased 2,400 square feet of office space at 4985 W. Diablo Drive from Red Hot Diablo LLC. Ryan Martin, Taber Thill and Patti Dillon of Colliers International represented the tenant. 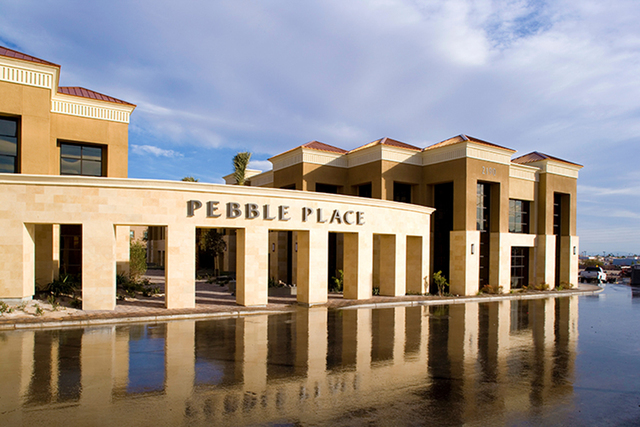 ▶ Preferred Trust Co. leased 2,180 square feet of office space in Pebble Place Business Center at 2140 Pebble Road. Suzette LaGrange and Kara Walker of Colliers International represented the landlord, CVK LLC. ▶ Casillas Group Investments LLC leased 1,191 square feet of retail space in Tropicana East Shopping Center at 4860 S. Eastern Ave. Chris Clifford, Steve Neiger and Brett Rather of Colliers International represented the landlord, Tropicana East Shopping Center.